Just wrote my first 8 bars of counter point. Until last night I didn't know anything about writing counter point, other than loving it when I hear bach. I downloaded this book "Counterpoint and How to Use It in Your Music" which is pretty easy to get started with, once you get used to the sometimes puzzling translation. Never thought of it as a series of rules before. Notes have to have a certain direction (which currently in my studies is four) Both notes can move together up or down by the same interval, they can move together but at different intervals, one note can move up while the other moves down, and one note can stay the same while the other moves. There are rules regarding what type of movement goes with a notes a 5th a part, different rules for notes a third apart. First assignment was to write 8 bars of counter point off of a supplied melody. It is very much like a puzzle. I want to go here, but , no I can't because it is not the right movement, I have to use this note instead. They provide a sample bit of counter point to get you started. Amazing to listen to the difference between they sample they provided and the one I'm writing. even though it is the same melody in both, the counter point creates completely different experience. I could definitely see how a quick study of counter point could help when making harmony decisions off the melody for steel guitarists. Ah well, I knew this probably was not going to get any attention, but I keep trying. I'd love to find some forum just to discuss theory. If anyone knows one, instrument agnostic, let me know. Bill, you might like to take a look at Alan Belkin's YouTube page where he has posted a bunch of counterpoint lessons. When I found this set of videos I was quite interested to go through it, and bookmarked the page, but have not yet found time to do anything further with it. The classic text on counterpoint, Gradus Ad Parnassum by Johann Joseph Fux, was written in Latin and was first published in 1725. According to Wikipedia, a copy of this is the only surviving book from J. S. Bach's personal library of theoretical works. The text is still in use by students today. An English version of the Fux text, translated and edited by Alfred Mann, is in print or at least readily available in paperback on Amazon and other sources, retitled The Study of Counterpoint. It's actually an easy text to read and study, it contains lots of examples for practice, and it's only about 150 pages. It's written in the form of a dialogue between the student and the teacher, which might remind you a little of Plato's socratic dialogues if you've ever had a chance to study those. If nothing else, for someone who is interested in counterpoint it is a fun book to read and own - after all, Bach had it so we should have it too. I've worked a lot to develop facility to improvise contrapuntal material on the piano. One of the techniques I've used is to first memorize a Bach fugue, then practice playing it from memory while simultaneously transposing into another key. The transposition largely defeats muscle memory, so it becomes a process of playing the fugue "by ear," which involves some of the same skills as improvising. I've been using this transposition technique for a number of years, and have kept it up because I found it so beneficial for learning to improvise more than one voice at a time. I currently have a set of 10 fugues memorized from the Well Tempered Klavier and Art of Fugue that I rotate through all keys - again this is on piano. In this endeavor I may be in good company: There is a well known account of a young Franz Liszt going to meet Beethoven, during which encounter Beethoven asked Liszt to play from memory a Bach fugue, and after Liszt complied with that request Beethoven asked him to play it again but transposed another key, which according to the story Liszt was able to do. I haven't tried to do anything with counterpoint on a steel guitar, other than learn to play some conventional "licks" that involve contrapuntal movement of voices. I think feasibility is a much bigger question with the steel, though I have no doubt it would be valuable to develop whatever one can of a contrapuntal vocabulary on a steel. Great post John. Thanks for posting it. Jimmy Wyble worked on counterpoint for a considerable time in the 70s. You might try to run down the books mentioned below. "he developed a two-line contrapuntal approach to guitar and composed numerous etudes in this style. Many of these pieces were published in Classical/Country (Howard Roberts-Playback, 1973), The Art of Two-Line Improvisation (PMP, 1979), and Concepts for the Classical and Jazz Guitar (Mel Bay, 2000)." There was at least one Wyble LP demonstrating this approach. It was always hard to find, but it might be on youtube? Playing eharp is lonely path. I think there are all sorts of opportunities for counterpoint because of the unique tuning. Possibly of interest if you are feeling Bachish? 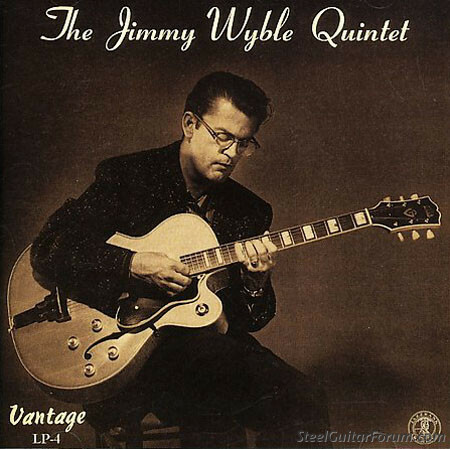 The early 50s track is from a 10 inch LP on Vantage by The Jimmy Wyble Quintet--accordion, clarinet, bass, drums, and Wyble. All but impossible to find the original, but it was released on CD in Japan, maybe in the 1990s? Going from memory, I think most or all of the 10 inch LP was also reissued on a standard 12 inch on Vantage with a totally different cover--maybe in the 1970s? At one time, the CD was available on Spotify and even Youtube. Don't know if it's still there. If you like that style accordion stuff, there's a lot out there by Art Van Damme, some of it with Johnny Smith on guitar. Here's a track list and a pic of the original issue. Thank you all for posting these great links and references. Plenty of interest here, Bill. I appreciate your quest to get into the deeper end of things lately. Bill, on that Ted Greene tribute website are a couple dozen studies in Baroque counterpoint. I’m going to have a look at them myself. Nice. Just downloaded the Counterpoint exercises focused on bass movement and already learn some new grips I hadn't used. Actually sounds pretty damn cool on the eharp cause there is very little bar movement compared to other tunings. Fux’s Gradus Ad Parnassum is the book to have. Soi I have heard mike. I assume it is translated ? Yes, get the translated version by Alfred Mann. It is an excellent read, too, written as a dialogue between master and student. Very entertaining and incredibly informative. I see John has already said all of this above..lol.